One of the secrets to Amazon's success is that they have a library of product reviews submitted by real customers. Online Shoppers love to see what other customers have written about products before making a purchase themselves. It is also evident that search engines such as Google are placing more emphasis on reviews. There is no question that it is truly in a merchant's best interest to collect reviews from customers. Soliciting reviews from customers is of paramount importance. Unless you remind them, most customers are not going to visit your online store just to submit a review and hence your review feature will be of limited value. For reviews to really take off in your shopping cart, you must email the customer after they have made the purchase. One benefit of emailing the customer to solicit a review is that they must return to your online catalog. At this point, they may shop again. With our eCommerce platform, review reminders are sent out automatically at an interval defined by the merchant. You may have also noticed that some listings on search results pages in Google now include star icons which indicate that a product has been rated by its customers. Google can pick up this information in two different ways. If a merchant is submitting product data to Google Merchant Center, the data feed file can include rating information. Another way Google can grab rating information is by crawling a site and looking for Rich Snippets. A Rich Snippet is basically a pre-defined syntax which wraps around special data like ratings. We ensure that your review data is available in both instances. In our Order Management System, merchants have the ability to accept, reject, or modify reviews posted by customers. Brave merchants can also set up their review configuration to automatically post reviews, although we don't typically recommend this. 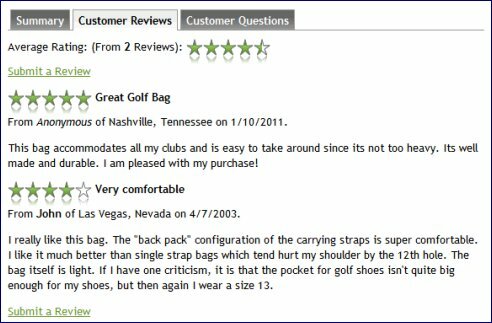 Building a library of reviews is critical to the long-term success of online retailers. We believe we have created one of the most sophisticated review engines in the ecommerce industry. If you are interested in learning more about how your company can utilize our reviews and ratings feature, please call 800-914-6161.